An antivirus is one of the most important feature to be included in your computer. An electronic device must be guarded against the malware that poses a threat to it. An antivirus works as a safeguard and protects the computer or laptop from coming into harm’s way. McAfee is one of the finest quality antiviruses with a brand name and popularity to its credit. It comes with a lot of high-end features that are absolutely worth the money! But sometimes, due to a stroke of bad luck, what happens is that, the antivirus itself gets corrupted. To help resolve this issue is what we have explained below. When the software is updated unsuccessfully, files get jumbled up and obstruction is caused while removing agent. In the VirusScan Enterprise (VSE), there are problems arising in the process of stopping Prevent McAfee. Previously installed versions have corrupted files of Mcafee. The above reasons are why we need to remove the antivirus manually. The user should try and remove McAfee using frminst.exe and the /force uninstall switch before attempting to remove it manually. Disable the services of McAfee protection in VSE if necessary. 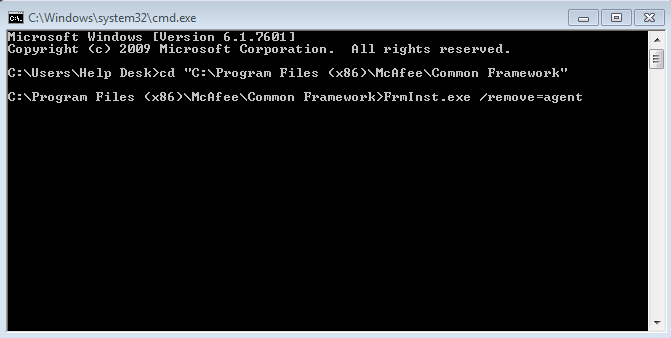 Go to Start, then Programs, then McAfee, and then VirusScan Console. On the Access Protection icon, make a right click and go to Properties. An option will come – Prevent McAfee services from being stopped. Wherever a change in policy is required, change the directory or computer level. Enlarge the VirusScan Enterprise policy on the right side. Just adjacent to the Access Protection Policies, there is an option of Edit. Click that option. Click the Access Protection tab and deselect Prevent McAfee services from being stopped. Remind an agent through a wakeup call to apply the changes, alternative is to wait for the next policy enforcement for changes to be brought into effect. Close the ePO console and go to step 2.